Who have you coached before? How will it work for me, personally? How do we calculate the ROI? And, of course, What's my next step? Our coaching is framed on years of experience working with senior leaders and managers across the globe, and especially those in the Asia Pacific Region . We know what works well, and are privileged to partner with excellent leaders from many industries, nationalities and backgrounds who have helped us hack the art and neuroscience of expert leadership. Backed by rigorous academic research , we'll help you unstuck your true potential in life and work. Dr John's own MBA and revolutionary Doctoral research in Management and Leadership Development, led to the creation of the Coaching Advant EDGE Development process and the Effective Leadership Model . Your coach, Dr John Kenworthy, is uniquely qualified and experienced to serve technically strong leaders and leaders in technology based companies because he bridges the worlds of technology and business with a wide experience in both. 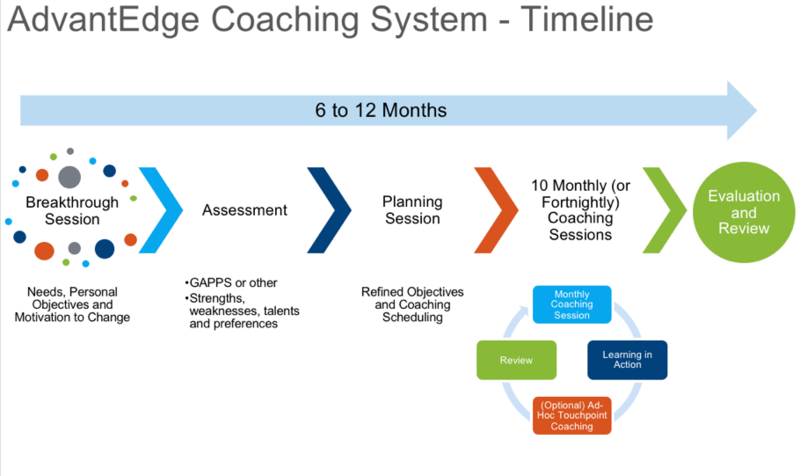 How does AdvantEdge Coaching work? Before we start coaching with a new client, we get together for a " Breakthrough Leadership Mastery Session ". This is a powerful session where our new client gets to meet and know their coach. Can we work together to achieve your desired results? During this first session, we'll help you uncover your needs , personal objectives and motivation to change. You will get a personal breakthrough and discover if we can work together to achieve your desired results. Once you commit to our AdvantEdge Coaching, we'll get you set up on our Private web platform, The AdvantEdge Coaching System , where we'll be communicating, sharing sessions notes, worksheets and resources with you, scheduling your sessions, and getting you to complete an assessment. The GAPPS assessment is the first and only psychometric instrument developed in Asia for senior leaders that reliably measures your Leadership Abilities, your Leadership Attributes and your Leadership Agility. You submit your responses online in just 20 minutes and then we'll have a coaching session to discuss the findings of your report and identify your development priorities. Lea r n mor e about our GAPPS Assessment Tools here. After this we'll have a planning session to structure your personalised development programme and schedule your coaching sessions. Coaching sessions are 90 minutes duration and (unless specifically arranged otherwise) are by web video conference (we use join.me, Skype or WeChat - whatever works best for you). We'll be following your plan unless something more critical demands our attention. After each session, you'll be equipped to implement some aspect of your leadership development in the workplace. This is " Learning in Action " or often called " homework ". This may be a new technique you will practice, or perhaps a tool you'll use to work with specific individuals in your team. You can contact your coach as much and as often as you need between sessions . You may want to arrange an ad-hoc shorter or TouchPoint session to support you in your learning in action, or something else. Or just want to communicate by email or a quick WeChat exchange. Before your next session, you'll review what has gone well and what has gone less well. And note anything specific that you want to work on with your coach during the next session. How much time do I need to devote to this and for how long? For most new clients, we schedule and plan for 12 coaching sessions over a 6 or 12 month period. If you can find the time for this coaching (and your "homework") every two weeks, then great. But most of our clients find that their hectic travel schedules and workload, mean a monthly session works best for them. We'll adapt as best as possible to your schedule. If you originally plan for 6 months and end up taking a year, that's OK. If you plan for a year, it's best to stick to that or you could lose momentum. Is it a fixed time and day every session? The Internet works almost everywhere now (including planes) but we'll work around your schedule and plan ahead with you. At the end of our coaching together, we'll have a r eview and evaluation session to measure the effectiveness of our coaching together and your results. What is this EDGE Development Framework? The Coaching AdvantEDGE System is so called because our coaching follows a unique process that few coaches appreciate. Dr John's Doctoral research focussed on Management and Leadership Development. He was interested how adults honed their leadership abilities (competencies) , developed their leadership attributes (character) and learned how to become agile leaders. 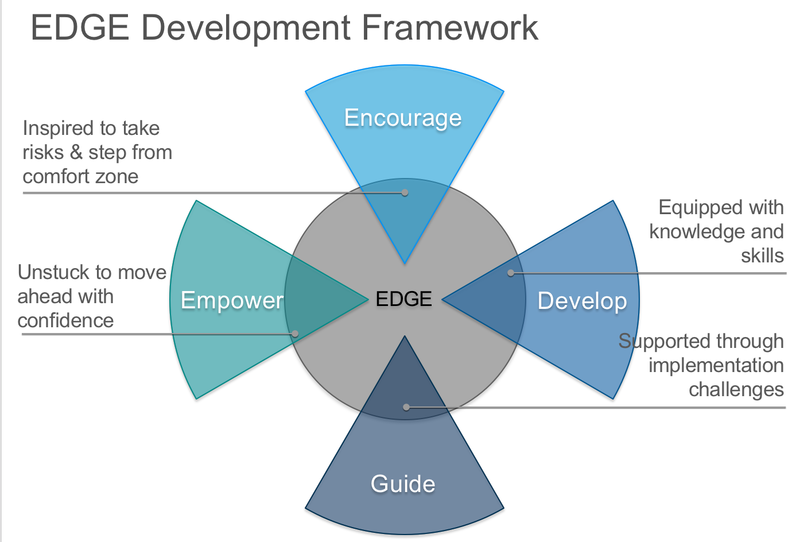 The EDGE Development Framework came out of that research and is the foundation of how we work with clients. We'll ENCOURAGE you to step out of your comfort zone and inspire you to try a new approach. We'll help you DEVELOP the skills you need and equip you with the knowledge to support that. We'll GUIDE you and support you through implementation in the workplace. And we'll EMPOWER you with the tools, templates, articles and resources you need to unstuck your potential and move ahead with confidence. All of our coaching is strictly confidential as you will understand, so naming names is rather difficult. We work with leaders from many internationally recognised companies such as ExxxonMobil, DSM, Vodafone, Shell, Marriott, and DHL. A few international financial organisations such as Temasek Holdings, Barclays Bank and DBS. Many APAC based companies, such as Sembcorp, SMRT, Maxis, Astro, Singtel, Optus, M1 and PCCW-HKT. And several SMEs throughout the region. Most of our clients tend to be from a more technical background or working in a technology business. We coach C-Suite executives, Country heads, General Managers, Plant managers, Regional VPs. You can see many public testimonials on John's LinkedIn Profile and we can ask specific individuals for their permission to provide a reference at an appropriate time. When is AdvantEdge Coaching suitable? Starting in a new job/position when you are expected to hit the ground running. Taking on a new role or responsibility, or starting in a new industry or a new culture where you have little experience, but need to gain the skills and experience quickly. When struggling with certain skills and performance areas and you wish to improve. When feeling you have reached a plateau in your career and want to explore options. What do you coach me to do better? We'll be better able to answer that once we have a breakthrough session and conduct your assessment, but generally, we'll work with you on developing the components of effective leadership together. In hacking the art and neuroscience of expert leadership we've found that there are six components to leadership that create the essential Trust and Collaboration that makes teams and organisations effective and successful. 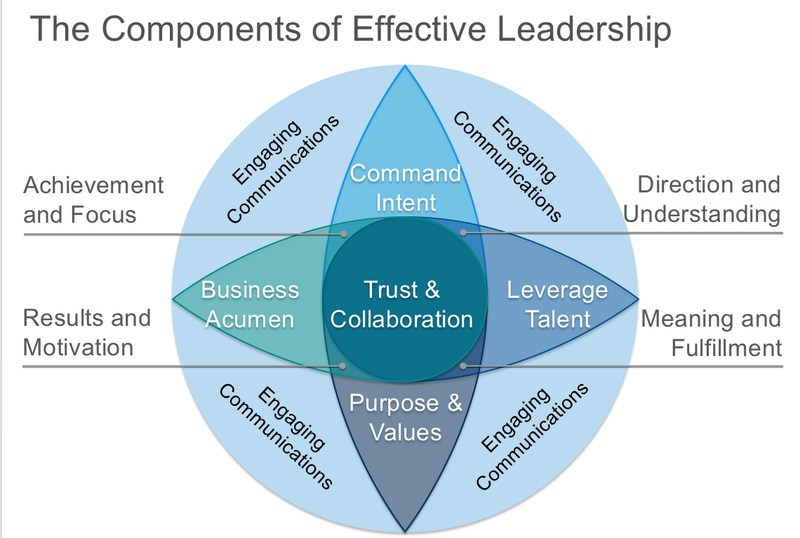 The Components of Effective Leadership enable you to build Trust and Collaboration for great business results. To achieve that, we might develop how well you establish Command Intent - the vision and direction for your business. We may help you identify and leverage your talent , and the talent and strengths of your team members so that you and they work best in your strength zone and throughly enjoy what you do. We'll discuss how clear you are on your purpose and values and guiding how these align with your organisation and team. We'll consider your business acumen and always keep the ROI for your business in mind through our coaching. And, as you can see in the diagram, all of these components require engaging and effective communications as the glue that holds everything in place. How do we calculate the ROI for Coaching with you? Another leader realised significant savings in excess of 23% of annual salaries in reduced staff turnover thanks to an improved. more collaborative style of leadership and communications. One client successfully negotiated a union's call to 'work to order' without acquiescing to the demands and saving the company millions. Another leader successfully implemented a previously stalled project to replace the IT systems throughout the business. These are just some typical examples of how leaders succeeded, in part, due to our work together. Not to mention the achievement of their personal objectives, improved relationships with staff, stakeholders and family. Many leaders find purpose and meaning in their work and lives through our coaching and begin to throughly enjoy each day as they leverage their own talent and learn how to delegate properly. AdvantEdge Coaching is special because we use a structured approach that retains flexibility to changing circumstances. So you know what we plan on developing together and then strategically improvise when needs demand. The EDGE development process is unlike other coaching frameworks because it is back by rigorous academic and practical business research. We've hacked Expert Leadership from around the globe, but focus on our home ground in Asia Pacific, and have created a simple, yet powerful model of effective and successful leadership . The GAPPS Assessment tool is the ONLY psychometric that reliably measures your Abilities, Attributes and Agility in Asia . We are not reliant on the more common US and European norms, but on what works well in Asia, and specifically your country. Your coach, Dr John Kenworthy, is uniquely qualified and experienced to bridge the worlds of Technology and Business . Schedule a Breakthrough Leadership Mastery Session with Dr John for new clients to establish your development needs, personal objectives, your motivation to change and suitability of our working together. Not ready for your breakthrough session or want to chat without obligation about working with your team?